I wasn't sure I wanted to read a cookbook written by a farmer. I mean it makes sense that where there are vegetables, there should be someone who knows how to cook them. But, somehow "John" just didn't seem like a great name for a chef, and what kind of dish could a guy with a pitchfork make? I already know how to steam, bake and boil my veggies. 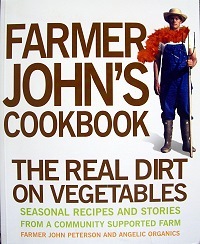 Turns out John has a whole staff of dedicated vegetable cookers, and the recipes (255 of them, covering 35 vegetables) they have come up with are just as unique as John and his staff at Angelic Organics. This is a very personal book. When you read it, you forget that it is a cookbook. You are taken along on a journey, reading a story about how this man's life unfolds on his farm over many decades. As you travel his road, you find you are excited to turn the page and learn what more he can contribute to your understanding of where your food comes from and how you can grow and prepare your own in a natural, harmonious fashion. If you are a backyard gardener, you will relate to his trials and relish his remedies. If you are a cook, you will wonder why you never put these herbs and vegetables together before. The main body of the book is divided into three chapters -- early, mid and late season harvest. Each of these contains a section for each vegetable that would be ready at that time of the year. I really like the little part of each section that gives you partners for that vegetable. For instance, for cucumbers, we learn that allspice, basil, cilantro, coriander, cumin, dill, garlic, horseradish, lemon balm, mint, mustard, oregano, parsley, tarragon and toasted sesame seeds are particularly nice. The main attraction to each individual vegetable section, though, are the recipes. Try Baked Cucumbers in Basil Cream. Now, I don't know about you, but I don't usually bake my cucumbers. The uniqueness of it all is what warrants this book a place on your counter.